Current View Ridge Middle School students will just miss the opportunity to move up the hill into the planned new 5th/6th and 7th/8th two-school facility on Hillhurst Road, but that does not mean they cannot have fun imagining how it will look. 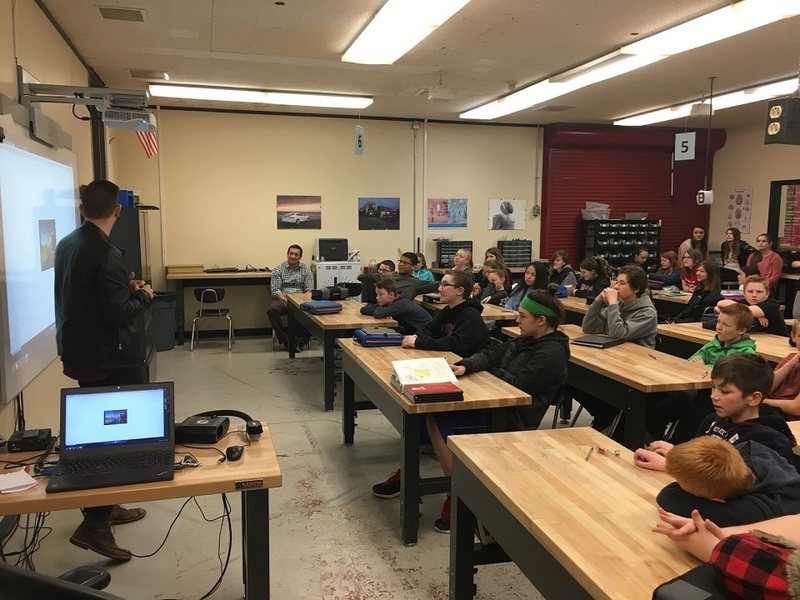 LSW Architects, the design firm working on the Ridgefield School District project, met with STEM (Science, Technology, Engineering, Math) students from Sheila Davis’ and Tylor Hankins’ classes on March 2 to share preliminary plans and solicit student ideas on classroom design. A bond to fund the new construction passed in February by a 68 percent vote of district residents. The new school is scheduled to open in the fall of 2018. Trevor Chayce shares a design graphic with View Ridge STEM students. During the visit, students learned about green architecture and sustainable building techniques like the use of natural diffuse lighting, passive ventilation systems, green spaces, and local resources like wood when designing a building. 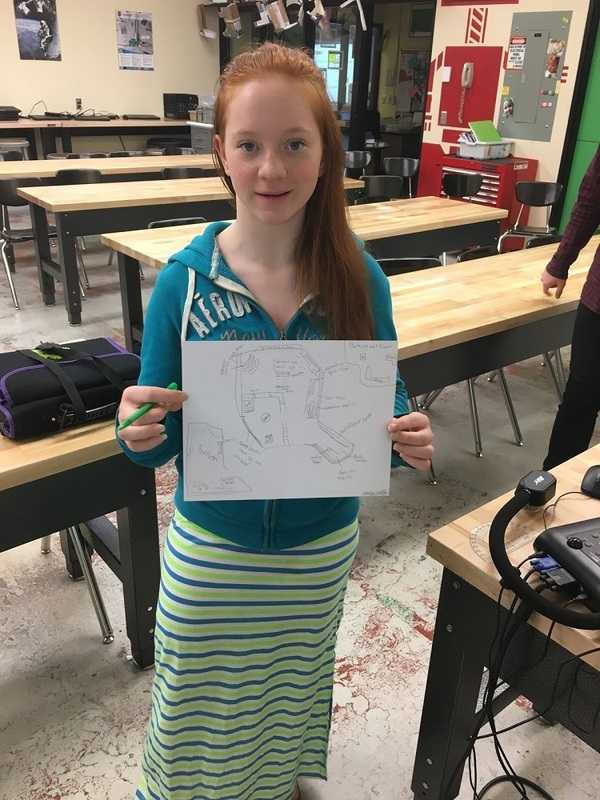 The students then designed a floor plan of their ideal school and/or STEM classroom utilizing green architecture design elements. After drawing their plans, students reviewed the floor plans and 3D views of the new school and had an opportunity to provide feedback and ask questions. They also gained insight into the education and life experiences of the architects that led to their chosen career. Eighth grader, Marissa Buttars shows off her school design. View Ridge eighth grader, Derek Kropp, enjoyed meeting the people who are designing the school. “I learned how much planning and measuring even before you build is needed, even looking at the soil to make sure the building will hold up,” he reflected. He also said it connected well with what he is learning in his STEM class. “Since we’re starting a new architecture unit, it was neat to see what all goes into it,” he said. Seventh grader, Katie Garcia, was interested in how the LSW architects use models as well as some of the green aspects of their work. “It’s not just thought up, they have to think of all kinds of things such as conserving energy by using skylights for natural lighting,” she shared. Like Kropp, she learned that there was much more to the process than she knew before. STEM teachers Davis and Hankins enjoyed working with LSW and saw this partnership as one that supports the work they do in the classroom. As Ridgefield continues to move forward building for the future, school district staff will take advantage of learning opportunities like these to enhance everyday classroom instruction.